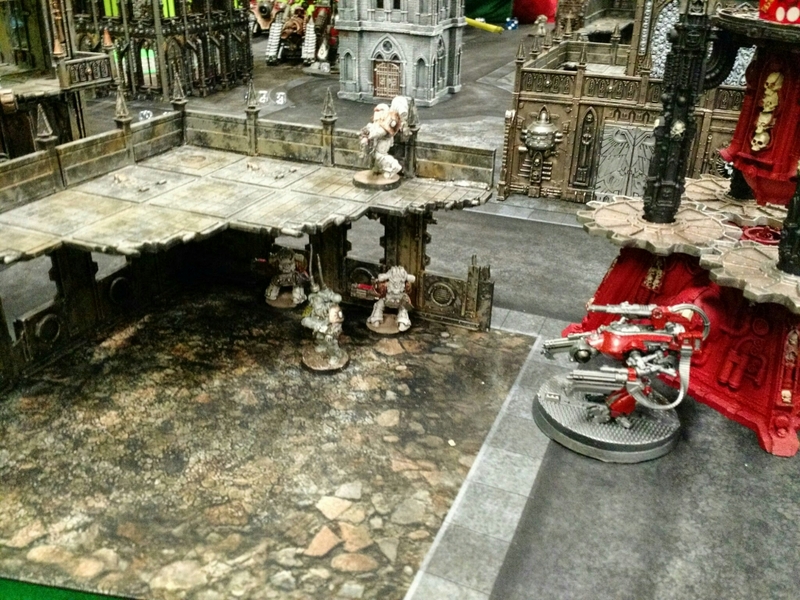 I played a 3500 point game versus Pete’s Death Guard. I don’t remember what the name of the mission, but there were 3 objectives that scattered and you had to control them at the end of a turn. I ended up loosing 9-8 for a super close game. 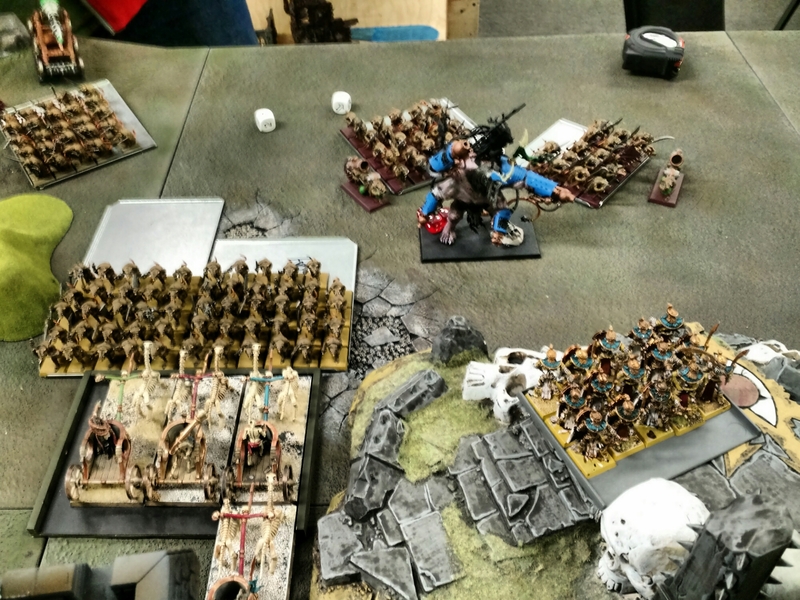 I got to play my Undead Legions army against Skaven this afternoon in and End Times game. We played with the new magic rules from Khaine and it really changed the feel of the game. It added a lot of time to get through the spells, but was also a lot of fun. I don’t see using them every game, but they offered a fun variant. 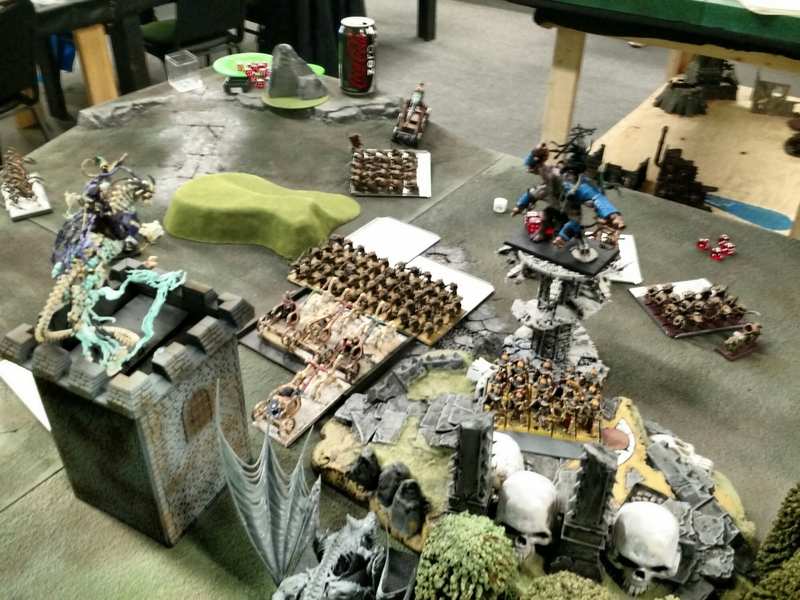 I managed to summon about 1000 points of models and then he would remove them in his magic phase, but it was cool to drop a Terrorgheist in the middle of the table to threaten his army. I had a blast and can’t wait to get the army repaired and start painting it up a bit better. I loved it. Pretty familiar, but we tried out one of the new missions using the tactical objectives. Absolutely great. Really made the game more interesting than kill each other or contest last minute and hope the game ends. I took a combined arms list of Lamenters primary with Sons of Medusa allies plus an Imperial Knight. Mephiston was a beat stick getting off Iron Arm plus Warp Speed almost every turn. Strength and Toughness 9, with 8 initiative 10 attacks! He would mow through whatever came near him. We did play a bunch of stuff wrong I’m sure, but I’m feeling really positive about the addition as long as you have a nice conversation before hand on what kind of game you want to play. Same as above, but dropping the stegadon, 2 skirmishers, and musician. Adding in 8 Cold One Riders. I managed to win both games, but took a real beating when Dweller’s Bellow went off on my Saurus block and in the second game on the Cold ones. The Bastiladon is absolutely pants in close combat, but is a decent support unit and managed to do some good damage with the Solar Engine. The Stegadon was nasty and really pushed combat in my favor. The skirmishers did great in both games, getting wiped out in each, but managing to do some good damage with their poison shots. The Saurus block was kind of slow and took a lot of fire and when they finally got in combat kind of whiffed it not rolling a single 6 for predatory fire with 16 attacks. Overall it was a lot of fun and I enjoyed the feel of the army. Things were looking pretty terrible after first turn. I’ve never played Dark Angels before and didn’t realize what deepstriking Terminators could do, not scouting bikes. Everything was right in our face turn 1 and he obliterated most of our troops and my Farseer turn 1. The whirlwinds all ignored cover and each hit deleted my crappy troops that were needing cover. By the end of the turn the only troops we had alive were about 3 guardians and the Tervigon. We decided to at least play a turn or two to see if we could do anything, and it turned out we could! 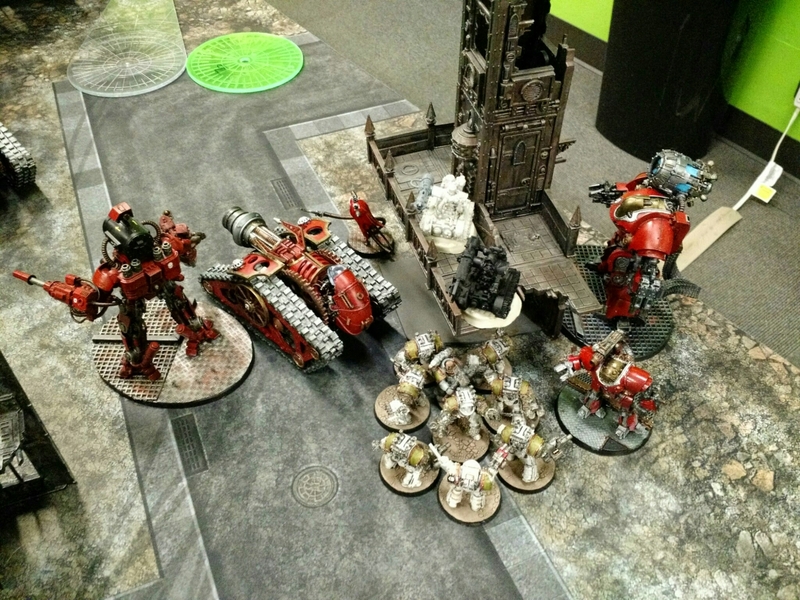 The Wraithknight showed his value when he obliterated 6 of the Terminators with his 3 TL plasma cannon blasts on terminators which were bunched up from deepstriking. The War Walkers, Fire Prism, Wave Serpent and Fire Dragons then unloaded into Belials terminators and brought them down by half. Everything that could assault at that point did assault to try and be locked in combat to take cover from the Whirlwinds. 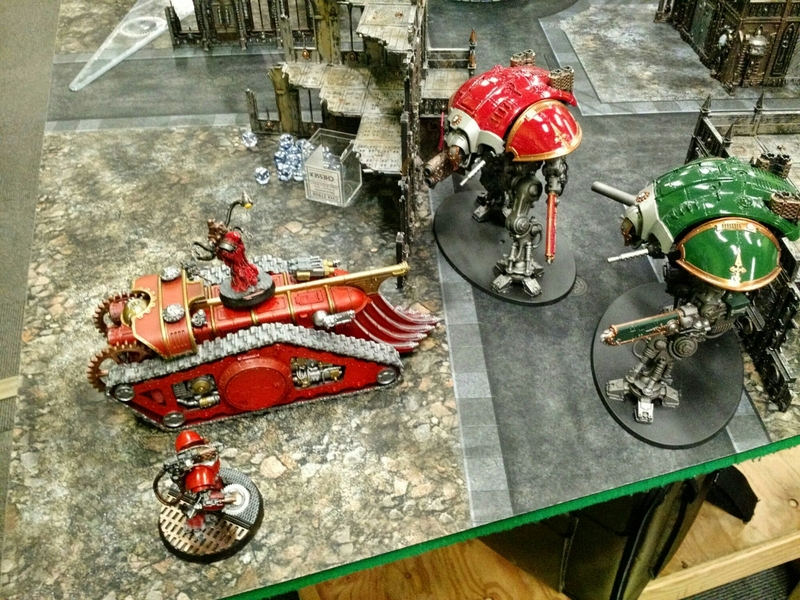 The Trigon and Wraithknight charged the remained 4 Terminators at wiped them out and only taking a single wound back. It’s pretty awesome for Terminators to need 4’s to wound. Turn 2 was very little shooting for the Dark Angels as most everything was hidden or locked in combat. The bikes did manage to shoot and then assault the Tervigon to death and put a wound or two on the Trigon. On the Eldar turn, the suncannon obliterated the other bike unit, while the Trigon and Fire prism whittled down Belials terminators. The Crimson Hunter came on and killed a whirlwind, but just barely. The Exarch upgrade saved it as he rolled 1,2,2,4 to hit and managed to strip the hull points off. The Trigon charged in and killed Belial, but the last two terminators managed to take his last two wounds. We ended up calling the game at that point as we were both pretty much out of troops and the new guy had to run. It was fun, and the parts that did survive the beginning were really fun and effective. Sadly I didn’t get to try a bunch of things as they all died early on. A few observations. I think we are going to see a return of mechanized Eldar. 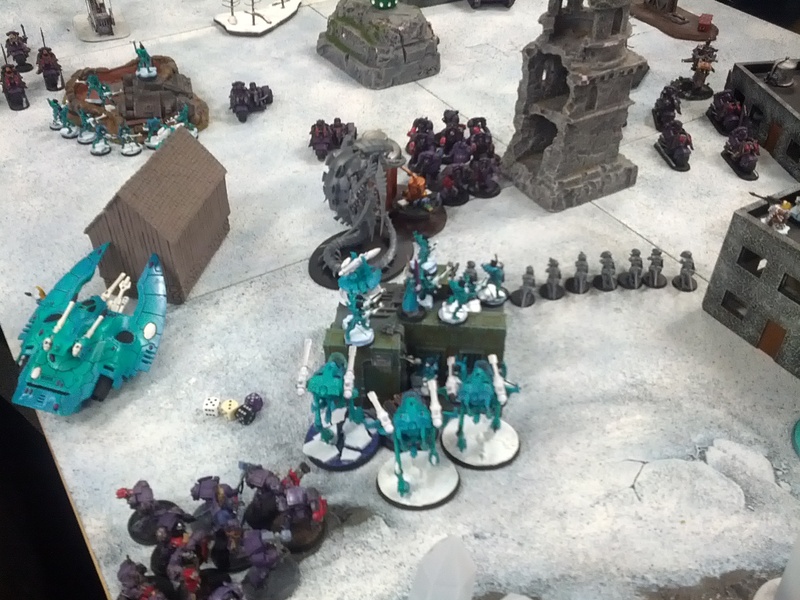 Wave Serpents are really good, and the troops are just to squishy to be out. The Wraithknight is amazing, and while there are some bad match-ups (poison) it is just extremely hard to kill. Plasma guns need 5’s to wound! I like the suncannon upgrade, but it runs 300 points to kit it like that. I can see a place for the stock models though at 240 and it seems a fair price for the incredible toughness. Guardians were pretty lackluster. There is too much cover ignoring weapons and I wouldn’t count on them as my soul troops choice. I think a unit or two of Wraithguard might be needed to provide some survivability along with Jetbikes for mobility. The crimson hunter is pretty nice, but I really think it needs to exarch upgrade to make sure it can fill it’s roll. Finally the Heavy slot is just amazing. Pretty much everything in the slot will be effective. To close, the game was a blast to play, and it really seems like the codex will have a lot of different builds that will be fun to play. I can’t wait to explore it more as I get more games in. So I managed to play a game today. 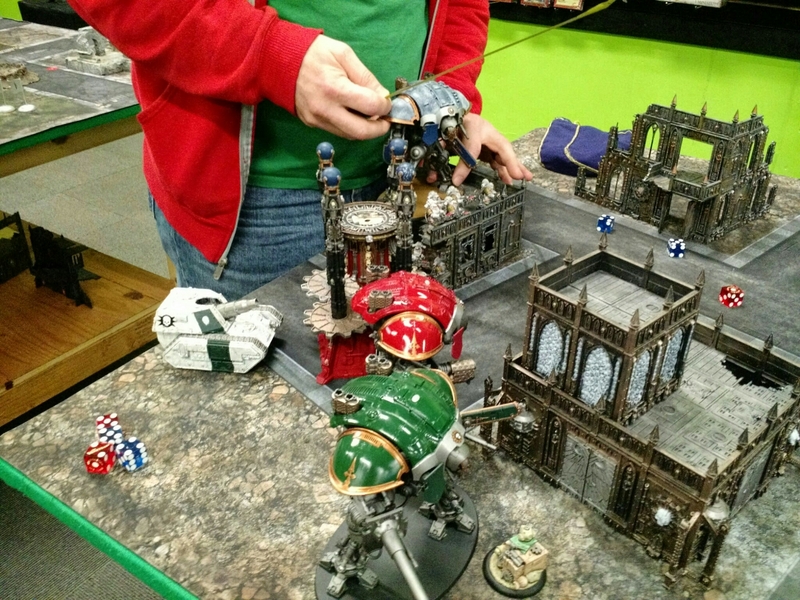 I dropped by Mugu games and got a pickup game of 1850 against a Tau/Necron player. I got absolutely smashed, but it was great seeing the army on the table. It was also fun seeing the new Tau and how disgusting they can be. I loved seeing the new models though and picked up a Riptide for my Tau allies. I’m sure I missed stuff in his army, but pretty much the main threat was the two Riptides and then the Broadsides with the commander. He dropped a lot points into them and all I know is they could all shoot different things, they all ingored cover, and whatever they shot, they deleted off the board. I thought they were all toughness 5, but it turns out that was only the commander. I kind of ignored them after they took a full War Walker broadside (guided) and didn’t take a single wound. I found later the broadsides were only toughness 4 and 3+ saves. In the end game I dropped Fire prism small templates on them to double them out and killed two. If I had realized that earlier, I would have focused fire on them with the bright lances and other 8+ strength weapons and that might have given me a chance at the game. I also forgot that the mission type was Big Guns Never Tire, and I could have scored with my Fire Prism at the end to at least make the game closer. It ended with all of my troops dead, two of his troops dead, but the Necrons untouched to claim his objective. Highlights and Low Lights. Rangers are awesome. 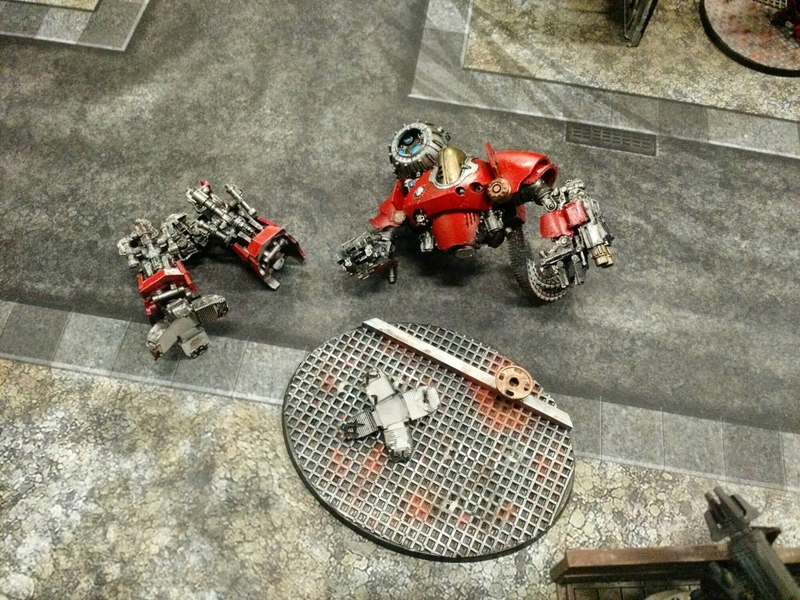 They put most of the wounds on a Riptide which I managed to bring down turn 2. The pathfinder upgrade is totally worth it, giving those ap2 shots and awesome cover saves. The Fire Prism also preformed admirably and I would definitely take it over a Falcon. The War Walkers didn’t kill anything, but they drew a lot of fire, and thanks to a 4+ Invul from Psychic powers it took a lot of shots to kill them. Eldrad charged the Riptide with one Fire Dragon and held him in combat for two full turns. If I had any sort of counter attack in the list, I might have been able to come in and finish him off, but he kept the Riptide locked up and not shooting my army from turn 3 – 6. The bad. Guardians are crap. They were really only there for objective holding, but with all the cover ignoring weapons the Tau had, they got slaughtered (even with a 4+ Invul from Eldrad). Everything is so freaking expensive in this codes for how it performs. Wave Serpents either need a 4+ invul or drop 100 points in cost. The Falcon couldn’t hit the broad side of a barn with BS:3. All the troops are so fragile and expensive, it’s just too easy to shoot them off the board. I might try a list with 3 squads of Rangers and 3 Jetbikes. Also aat 1850 the Eldar need two Farseers. I also need Fortune. So one take book powers the other Eldar powers. Overall it was a fun game but the cover ignoring weapons he was shooting me with were just too much to cope with. Battle of Epsilon Corvi – Mission 2. The Tyranid list is below. 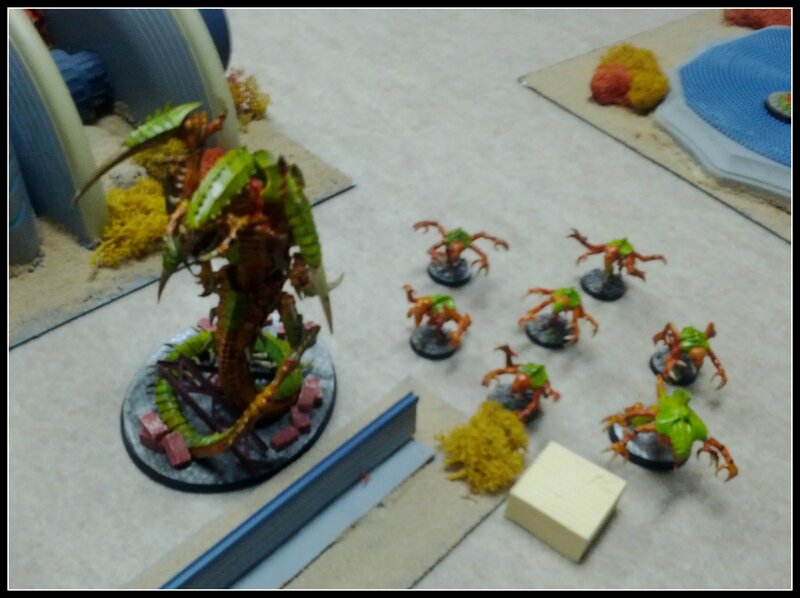 Sadly there was a mistake on the expected points value, and the Tyranids were only 1500 points. This definitely skewed the game in my favor. Tyranids had first turn and they slowly advanced up the middle. 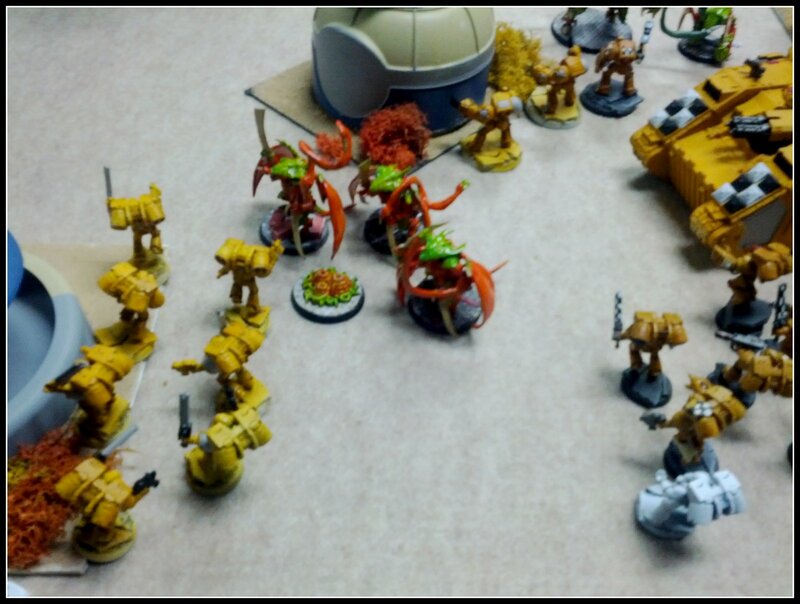 Nervous about the flamers in the front of my army, they tried to stay back a little, but not far enough, as the flamers were able to move in and wipe out one of the units of Genestealers. 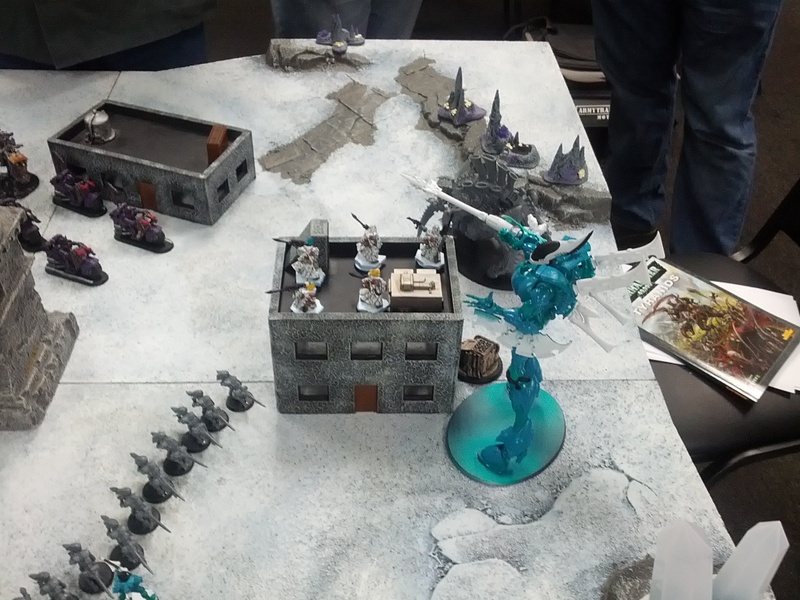 A couple marines got killed by the force dome psychic power as there shots bounced back. The next turn the Gargoyles, Hormaguants and Trygon wiped out the two squads. The free overwatch hits with the flamer managed to thin out the Gargoyles pretty well, but didn’t do much to the larger creatures. The other unit of Genestealers assaulted an assault marine squad in cover, and with the lack of grenades, were fairly ineffective. The Vanguard Vets came in and assaulted a unit of Zoanthropes and killed one, while Mephiston made a huge 10″ charge and killed the Trygon, Mephiston with Iron Arm and Warp Speed made him super nasty in combat. Third turn the Hormaguants charged into Mephiston and managed to bring him down to one wound but the Sanguinary Guard joined in and wiped the unit out. The flyrant charged into the vanguard veterans and killed two, but the return attacks finished off the big bug. The genestealers lost combat and ran, though they managed to get into cover. Fourth turn was mostly re-positioning and the movement toward objectives. While a few smaller combats finished up. Going into the last turn the Tyranids were down to the Harpy, one Zoanthropes, and a couple Genestealers. 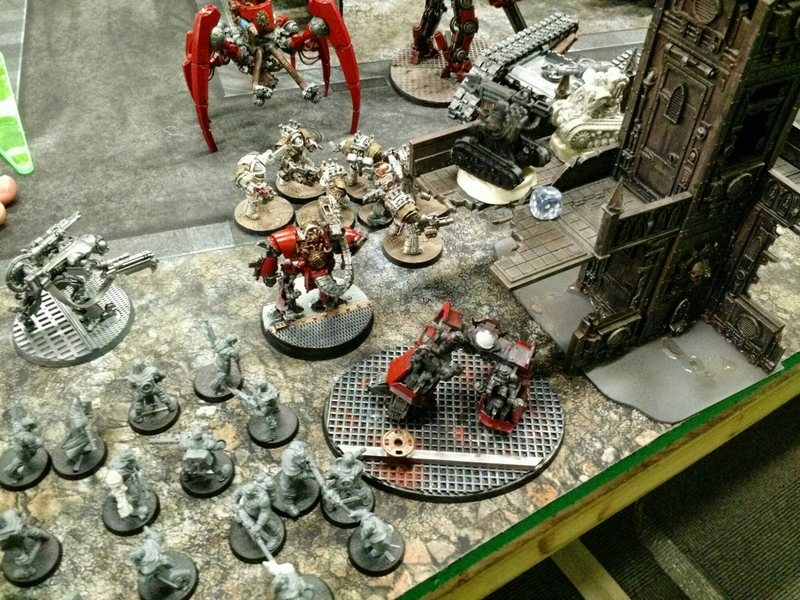 Mephiston was stuck in combat with the Zoanthrope and genestealers, and an assault squad managed to ground the Harpy and the TH/SS Terminators pounced on it out of the Land Raider. The game ended on turn 5 with a great victory to the Lamenters. They of course had a huge upper hand since they were playing with 250 more points! Always check lists before you start a game. The game was a blast, and we have two more missions in our mini-campaign. Learned a bunch of stuff about 6th edition and the army, and I’m really enjoying the new mechanics and play-style. We played with mysterious objectives this game, and they really didn’t have any impact on the game. Even the sabotaged one never blew up the entire game. We never remembered challenges, and I keep forgetting to throw grenades, something I’ve been wanting to try and always forget! Can’t wait for another game. The strike force has been readied. They deploy tomorrow to cleanse the bio pools the filthy Tyranids have established on the world of Epsilon Corvi. The objectives must be destroyed or there is real danger of losing this world. After action report will be given tomorrow. This will be the second game in a small narrative campaign Michael and I are playing. Really excited to get a game in, and as a bonus all of the models I will be using are fully painted! For my last game of 5th Edition I decided to bring out my ignored Eldar army, Michael came over and we played the Battle Missions Book mission, Infestation. 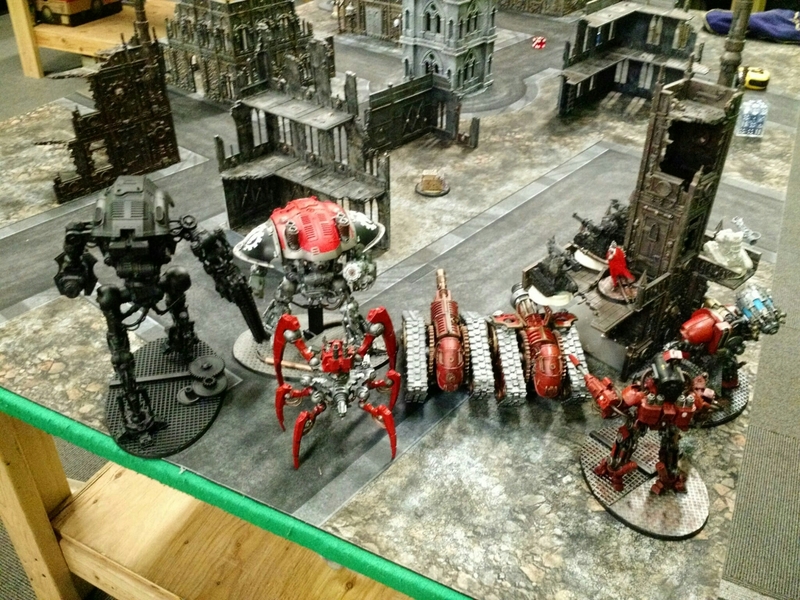 This represents the end of a Tyranid Invasion and the planet is destabilizing (as a result all area terrain is dangerous). The Eldar deploy completely in one table-quarter and the Tyranids get the other three (though they can’t deploy within 12″ of my deployment zone. In addition the Tyranids all get Stealth, and the Eldar all get Preferred Enemy. I was really excited to play a different mission, as I am more of a thematic gamer, and don’t rally like the standard missions in the book. I won’t go into all the details but the Eldar won 8 Kill points to the Tyranids 3. The MVP’s for the game were definitely the War Walkers who with Doom and Guide erased much of the giant Gargoyle swarm and the Hive Tyrant. 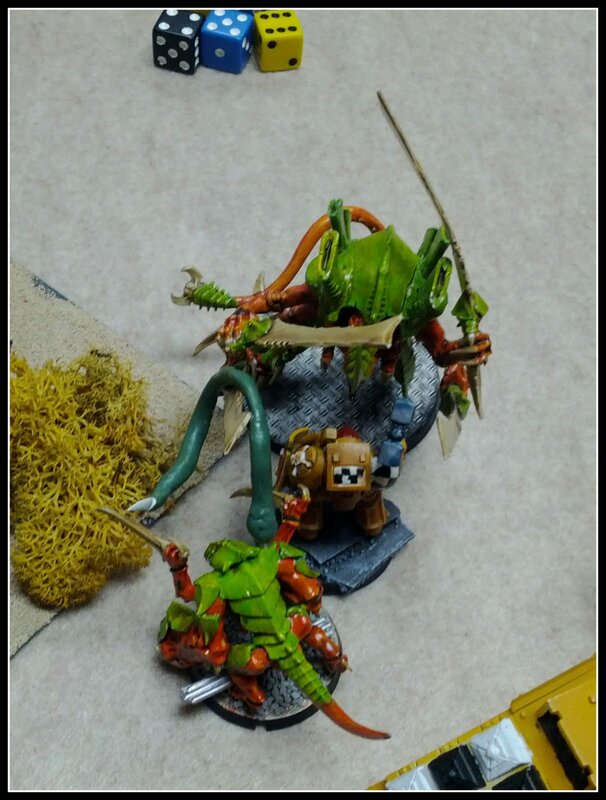 They took a nice dent out of some Genestealers and the Zoanthropes as well and only lost a single weapon (they were nicely bubble wrapped and he didn’t have any long range shooting). The other was actually the Guardian squad. They were fortuned up on the second turn and the Warlock and one normal guy actually survived a squad of hormagaunts and Genestealers assaulting into them. That allowed me to focus fire on some incoming squads and probably won me the game in the end. The Striking Scorpions were the biggest fail of the game. Another screening Guardian squad would have been just as effective and cost way fewer points. The Shining Spears were better than I expected, but just don’t have enough attacks to do much for their point cost. The Night Spinner was fun as well, but not better than another 3 War Walkers would have been. In the future I would drop the Spears, Night Spinner and Scorpions and pick up two more Guardain Squads, a small unit of Pathfinders and 3 more War Walkers. One problem the Eldar have with the Tyranids is the high initiative, something that they depend on to survive. The Tyranids on the other hand have trouble dealing with the massive amounts of fire (24 Strength 6 scatter laser shots, and 30 Bladestorm shots with doom and guide is rather disgusting). I had a ton of fun playing, though I’m excited to see what 6th edition will have to offer. So I managed to get a game in today after a month and half or so of not playing. I played Mark from The Overlords Podcast and we played all three mission types in Bay Area Open style. We did do a few things wrong, in that we did all five objectives for Seize Ground rather than just three, and we did an even distribution Nova style instead. I would be interested to play the “correct” way in the future. We had spearhead deployment and I won the roll, but elected for Mark to go first. He deployed everything except his Trygons. I deployed everything, but the Storm Raven full of Terminators plus Dreadnought and outflanked the Baal. On his first turn he moved most everything up, and shot a few marines dead with the Hive Guard. 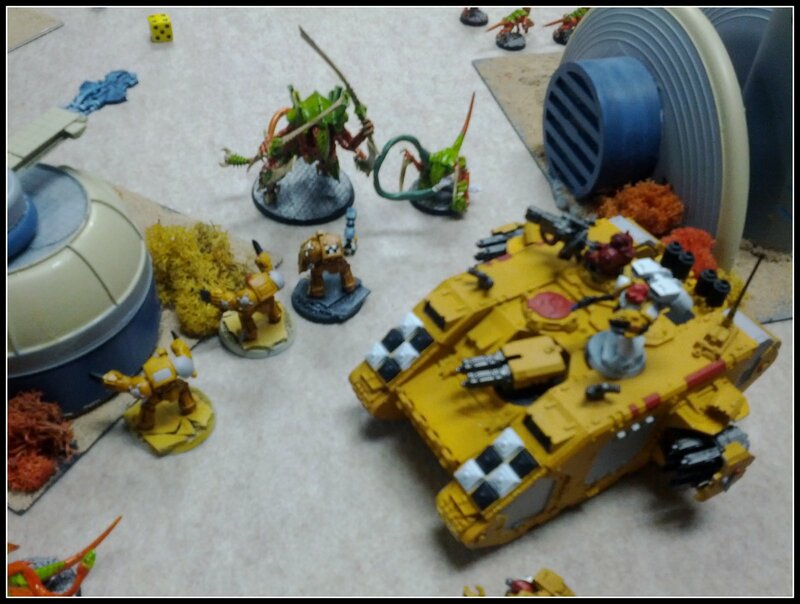 On mine I moved up, skirting to the side away from his infiltrated Genestealers on my right with the Assualt marines and moved the Land Raider up to let the Terminators get an Assault on the Hive Guard and giant Devourer termagant group. I managed to kill on the Hive Guard with shooting and then multi-assaulted the HG and termagants with the terminators plus Librarian. They managed to wipe out the Hive Guard and put a bunch of wounds on the gants as well. The fearless wounds killed off the last wound on the Hive Guard and took a few more of the little bugs out as well. On turn two both of his Trygons came in, one on each side of my Assault Marines and had some ineffectual shooting. 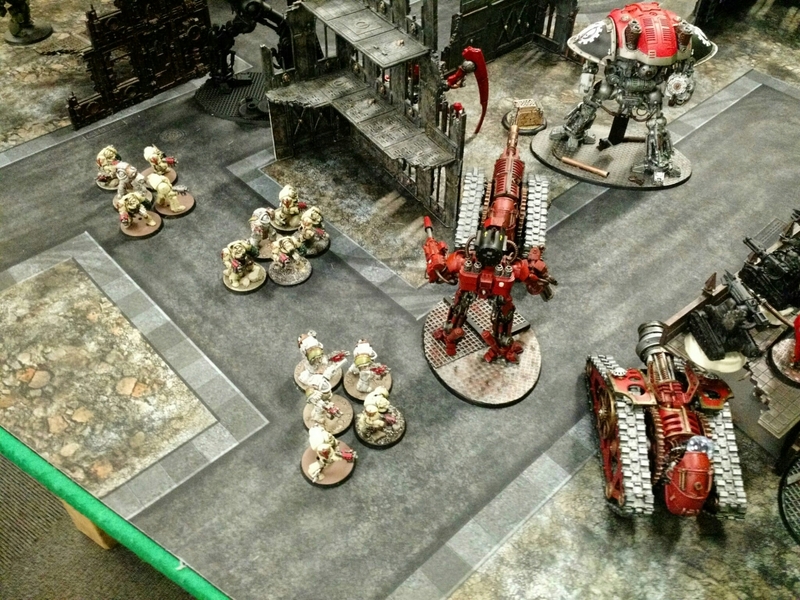 He brought a unit of Shrikes into the Terminators, but was just short of getting the Swarmlord into the Terminators. He did kill the Librarian rather easily and another of the Terminators. On my turn the termagants were finished off, as well as the Shrikes, but he was able to position his Swarmlord to charge them on the next turn. I unloaded both assault squads into one of the Trygons and then assaulted it. One of the squads was at BS/WS: 1 because of a psychic power but actually managed to hit more than the unaffected squad. They did just enough wounds to kill it and consolidated in opposite directions towards different objectives. On turn three he wiped out both of my troop squads, one with a Trygon, the other with the remaining Shrikes. 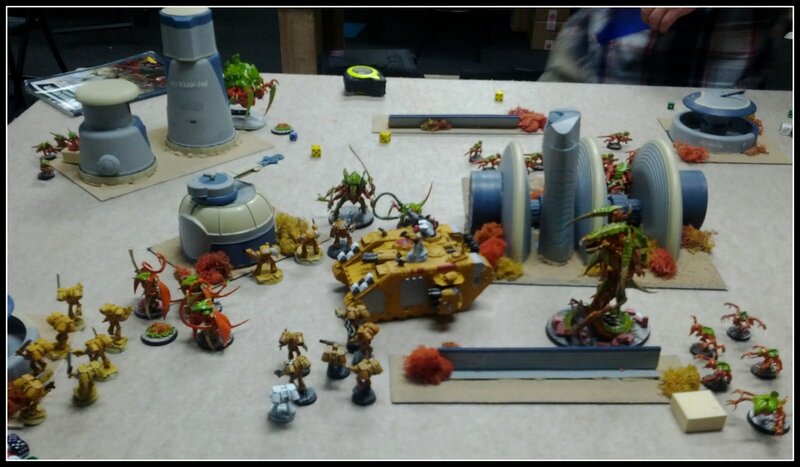 His Swarmlord charged into my Terminators and killed two, leaving one lone Terminator to fend for himself. 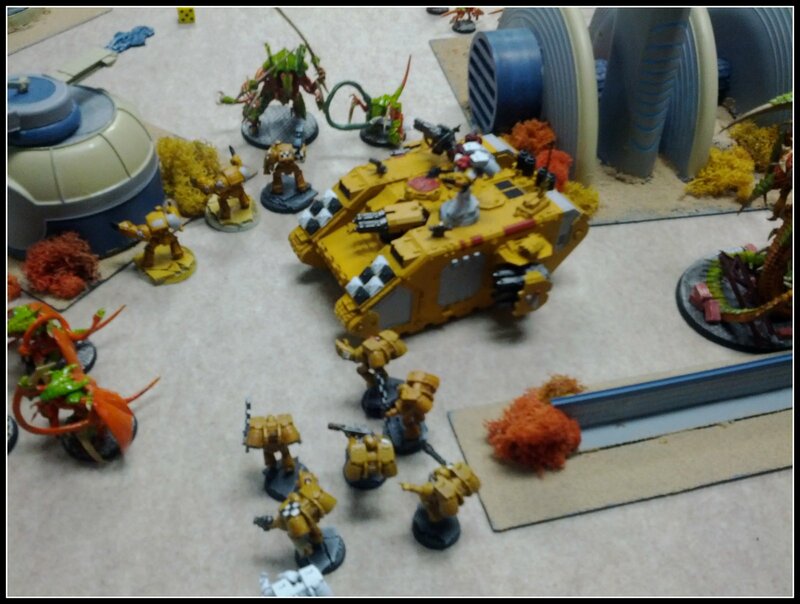 It was looking nasty for the Lamenters but both the Storm Raven and the Baal managed to come-in from reserves. The predator outflanked into his deployment zone and roasted the 5 termagants the Tervigon has pooped out on the first turn. The Storm Raven moved on and split the Terminators off to one side and the Dreadnought off to the other. The Furioso toasted the Genestealers with a heavy flamer and then assaulted, and I got to see the magic of the Blood Talons which chewed through the entire squad. 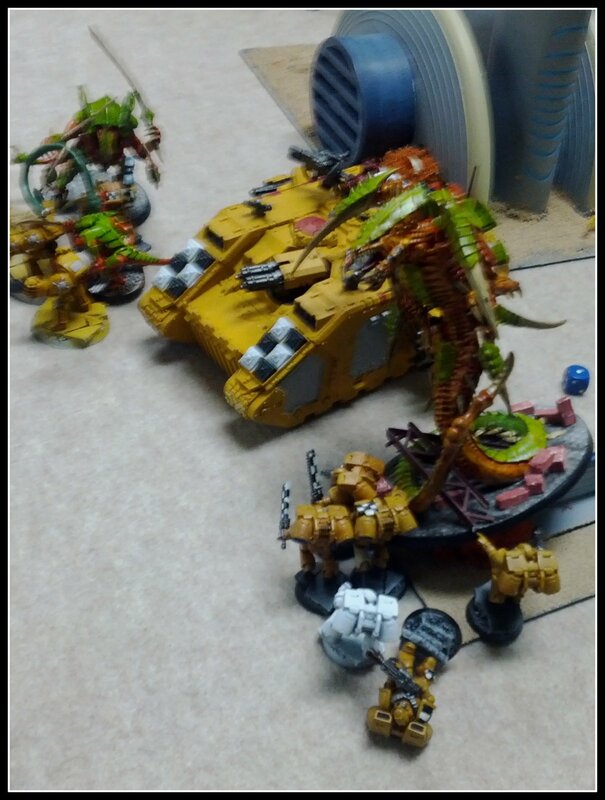 The Terminators charged the Trygon and brought it down, while the Land Raider zoomed up to shoot at some Termagants that were running away to grab an objective. At this point my only hope for even a tie, would be to kill off his troops remaining: 3 termagants on the other side of the board, and the Tervigon on the other side that was down a couple wounds from pot shots. 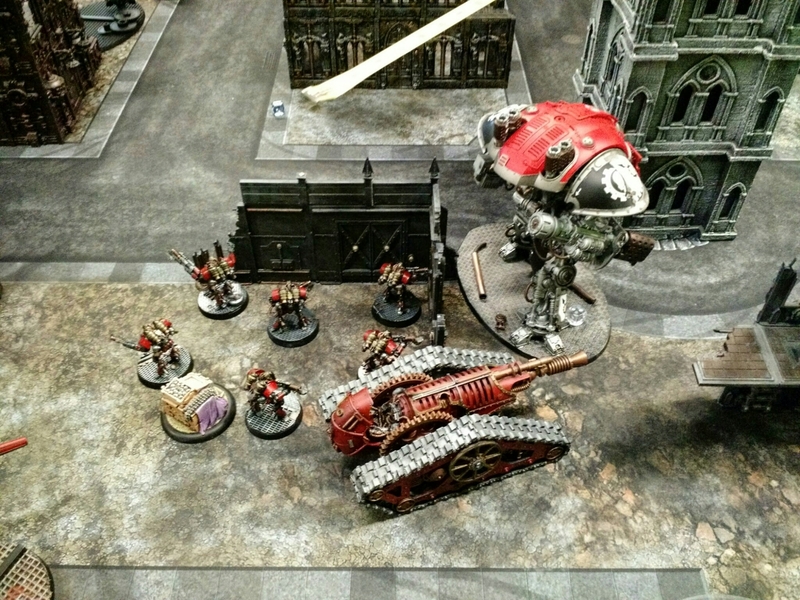 He charged in and immobilized the Land Raider, while I made a desperate gamble and jumped out the Sanguinary Priest inside to shoot and charge the Tervigon. Brought him down to one wound, which he then destroyed the Land Raider and priest in retaliation. 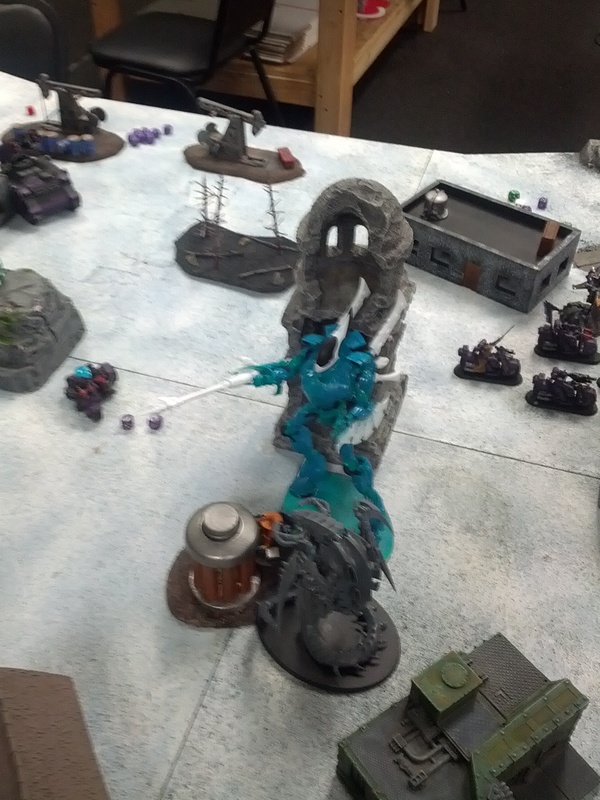 The Baal zoomed up and flamed the Tervigon as well bringing him down to a single wound. He immobilized the Storm Raven and killed off all but one Terminator as well. On turn five I was down to one Sanguinary Priest, One TH/SS terminator, and an immobilized Storm Raven. I shot and killed the Tervigon from across the board with the Storm Raven’s Lascannon and then made a beline across the board with the Sanguinary Priest in the hopes of catching the two termagants still alive to kill of his last troop. It went to turn 6 and I managed to shoot and kill one gaunt who fled off the board bringing the game down to kill points. After counting up KP’s I had killed 10, while Mark had killed 9. Victory was mine. Though at a horrible cost. Only a lone Sanguinary Priest was alive! He will definitely be getting his paint job improved as a reward! I had a ton of fun playing, and Mark really helped me play better. He had a bunch of suggestions as we played and helped me understand the army much better. He’s a real stand up guy and a ton of fun to play against.